This week was a good one for me at Walgreens. I didn’t get a paper this weekend, so since I didn’t have the coupons from it I had to dive into my stash. I researched and prepared before leaving by checking the Walgreen’s site (and printing the $5 off $25 coupon), Madame Deals Walgreens Rock Bottom Deals page, and STL Mommy’s Walgreens Weekly page. Okay…on to the thrifty-ness. Today, my friend Sarah and I (and Grayson, of course) went to Walgreen’s. 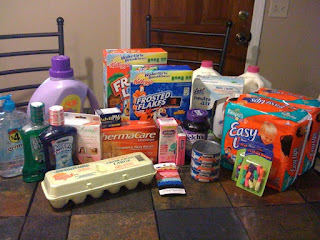 I got the following items for $51.04 after tax and using $12 in RR from last week’s trip. I’m going to go in order on my receipt so I don’t get confused…it doesn’t take much. I also received $17 in RR to use next week, and got a rain check on 50% off Airwick Motion Detector Spray thing…I can’t remember exactly what it’s called. I have a $6.00 coupon so it should only cost me a little over $1…we’ll see. =) According to my receipt, my total savings was $69.77. Woot! Oh, before I forget. Somehow I remembered awhile ago I had won a $10 Gift Certificate to Alice.com. 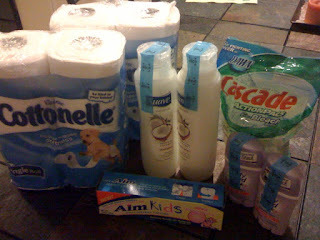 Shipping is always free on Alice.com, so I figured I’d grab a few things we needed w/ my GC. So there ya go…my ‘Thrifty Thursday’. I must say that even though I planned on taking it easy this week at Walgreen’s, I’m glad I didn’t…I’m pretty proud of my savings. Link up using the MckLinky below and share your savings! Old Navy is a great place to get basics like socks and underwear too! My son loves the Colorful footballs and basketballs they have at Old Navy! Thanks for twittering about this! I have tried to "win" these on the ON site but I never got anything good. Not sure I really like the way they have gone about this promotion But I would still love a coupon! I love old navy and need to take my kids school shopping…. I am a blessed mom of 7 who would greatly benefit from winning this. This military jacket for boys is super cool! I like these boys' canvas sneakers. They look very current and the price can't be beat. With the price reduced from $14.50 to $10, it's a good time to stock up on boys' sweatpants. My 6 year old would go crazy for the Star Wars t-shirts. He's a big Star Wars fan. Interesting…I was just looking at the boys' section and noticed they have a category called "husky sizes". I thought that term was no longer used. Hoodies always come in handy! This vest would be darling on a ski bunny! Wow, these suede boots for a baby girl are so stylish and sophisticated! This tiara pajama set is beautiful! This heart dress would be precious on my little sweetheart! These silver ballet shoes would make any little girl feel like a princess! The price is really affordable, too. This baby apron dress is adorable! I really like the brown and pink stripes. This striped hooded baby sweater is so cute! It's perfect for fall! I subscribed to your blog (#2). I wonder how Old Navy's back-to-school sales are. I guess I'll have to take a look at their site and see. I think the new Old Navy campaign with the modelquins is pretty neat. The videos are funny. Silly me…I just re-read the rules and it says the giveaway ends Monday at noon CST. Sorry I missed that the first time! Probably the favorite Old Navy purchase I've ever made were swim shirts and trunks for my sons. They have some really cute boys' stuff there! Old Navy has some nice maternity items. I bought some tops and a dress there earlier in my pregnancy. Jess, I bet you're sorry you said "no limit" on the number of comments! I can REALLY use the $50 off coupon. I've been trying to get the most sought-after Old Navy coupons, but I never seem to be online at the right time. They update the site so late! "Life at 30" is an original blog name. If I had a blog, I guess it would be called "Life at 33". I love the heart in the sand picture on your masthead. When will the giveaway be over? I'm just curious. I would love to win this so I can take advantage of my state's tax-free weekend! There's no limit on leaving comments for entries? I could become quite persistent, if I put my mind to it! I'd love to win! I'm due in 2 1/2 weeks and I could use the coupon to buy my baby girl some clothes. h My I would LOVE LOVE LOVE this!!!! I am hoping to get somethings there soon! I subscribe!